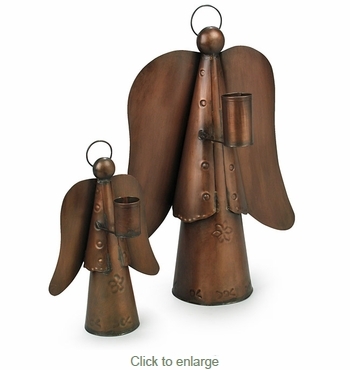 These Mexican tin angel candleholders are handcrafted by folk artist in Mexico. Each angel is a work of art that will make a great gift for the holiday season or add a festive and rustic look to your holiday decor. As with all of our hand crafted folk art items, expect some variation in size and color to these uniquely designed tin angel candle holders. Candles not included. AS8005 4.5" w x 3" dia. x 7.25" Tall $11.50 ea. AS8007 9" w x 4.5" dia. x 11.5" Tall $24.15 ea.